One of my friends recently viewed my penny rug scrap bag pincushions and asked if the term penny rug originated with me. I told her that it did not and that I promised to do a blog on the history of penny rugs and what I now have come to call penny rug art. Perhaps there are others that don’t know about penny rugs, their history and how they have now come to be little mats that decorate our tables, chests, or beds? I will divide this subject into two blogs: the first about how I came to do penny rug art, and the second about the history of penny rugs. Years ago, I was spending lots of time sitting with my mother, keeping her company when she lived in an assisted care facility. Being a nurse, I took care of her until she needed more than I could provide. When she had to move out of her home, I felt it only fair to spend a great deal of time with her, as I in no way was “packing her off”. I have never been good at “just sitting” without some sort of needlework in my hands to keep me busy. I was raised with my dad’s philosophy that "busy children, don’t have time to get into trouble". I am not sure that his premise was true, but nonetheless, I did learn to keep very busy. If there was time to sit, I needed to be productive doing something, for listening, thinking and "just being" were not enough. Unless I am reading, needle art or mending has become "a habit". I think my mother deserves some blame as well, for she is the one that instilled my love of needle work, and I later learned that if she sat as a child, it was mostly in front of a quilt on a frame and with a needle in her hand. 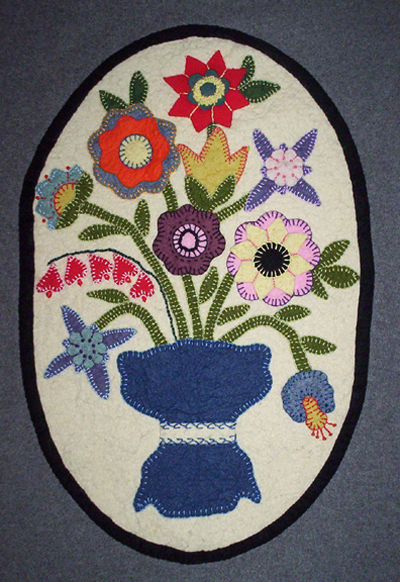 At the time that I was "sitting with my mother", I had seen an article on making penny rugs, and they looked fun to make as I love to embroider, and appliqué but hated having to turn the edges under as you do in traditional appliqué quilting. Working with felted wool, this step could simply be eliminated. While I didn't use a specific pattern for Spring Flowers, I did draw inspiration and compiled flower references from my mother's quilting book collection as well as graphic flower and plant motif sourcebooks. My mother had many quilt applique and pattern books which I soon adapted to make into penny rugs and if I cut pieces out ahead of time and carried them with me, along with an assortment of pearl cotton, I could sit peaceably for hours, especially when my mother napped. This is how I started making my first penny rugs. I pull my patterns from various sources. I was most inspired by Darcy Ashton and her publications. The bunnies and vegetables come from her Grandma's Bunnies Book. The next question came from one of my mother’s nurses when she asked what I was going to do with them. In truth I didn’t know as in my house there is hardly an empty table, dresser top or bed to simply decorate. My love for stitching didn’t slow me down in making them however, and later she asked, “Why couldn’t you make them into a quilt? This was the best solution to the dilemma as to what to do with them. This is how my first penny rug sampler quilt started, though at that time, I had yet to see a wool quilt in any quilt show. Now I see at least one at every quilt show. 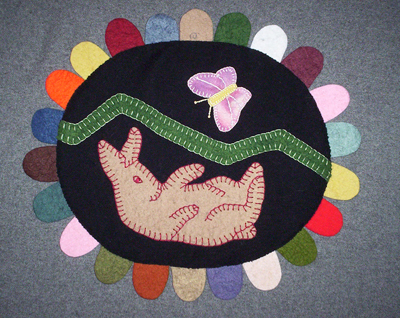 I have since heard that in Australia there is a museum of wool quilts. My second piece started after seeing a beautiful hand hooked wool rug that I couldn’t afford to buy. Sulking all the way home about not being able to afford to buy it, I decided that I would adapt the rug pattern to make another penny rug styled small quilt. Need and want, I have found, often inspires my creativity. I do think that sewers "are cut from the same cloth" and don't we all think, "I could make that"? I don't think this so much after going to The Vermont Quilt Festival, though it has definitely increased my enthusiasm for trying out new techniques. My own health declined after my mother passed and I needed to quit my nursing job to begin a long term treatment and so once again I needed to "keep busy" while sitting. Though neither of these quilts were finished, I tried out a pincushion pattern that I had wanted to sew for many years. A smaller project seemed more do-able at the time, and I couldn't seem to make just one. 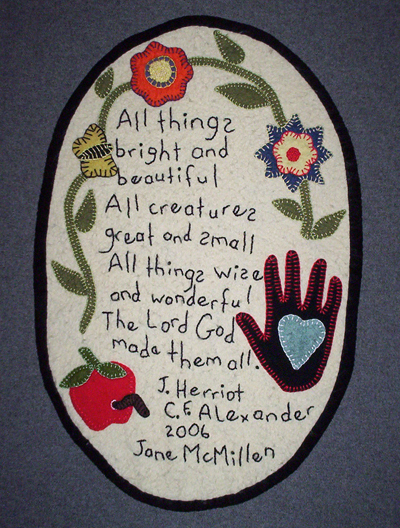 Soon I was adapting the pattern and making pincushion after pincushion using felted wool with penny rug styled primitive designs and each was different from the one before. 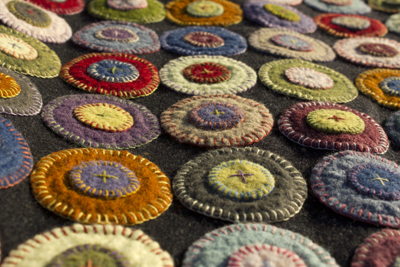 I still don't understand how I undertook big projects when I had little time, and having more time I needed smaller projects, but that is how I came to do my penny rug styled functional pincushions. 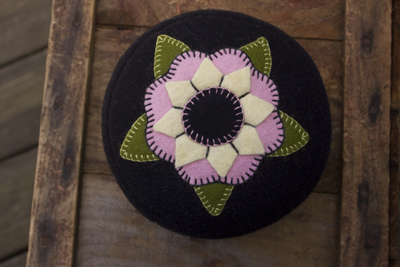 My first pincushions were stuffed with polyester fill, but I soon changed to packing them tightly with crushed walnut shell just like I did my tomato pincushions and sold them at our local craft shows. 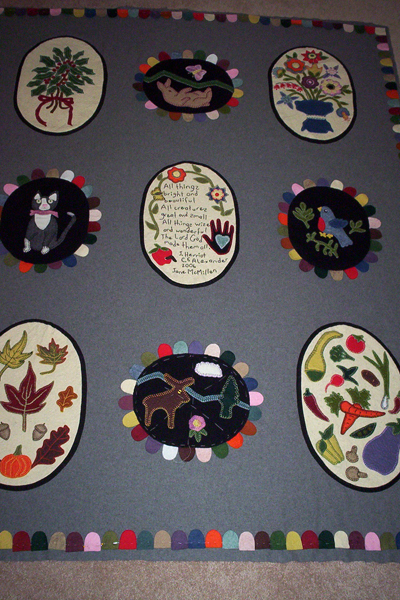 Ornaments and appliqued pictures came next and "took on" the same primitive penny rug style and I am still discovering applications of this style in making other items. I now work on my penny rug wool lap throw at shows when I have time to "just sit" and I still plan to quilt my penny rug sampler. My habit of doing hand work has turned into live demonstrations for my customers and I have enticed others to want to try their hand at this old traditional art form and "get in on the fun". My patterns and kits have come about at the request of my customers. Perhaps, like me, you will try your hand at this simple, fun, and traditional needle art and create your own heirlooms? If you do, I must warn you that your children will want to "get in on the fun" as well. Decorative thread boxes aren't unlike boxes of crayons of wonderful colors that fascinate children of all ages! While I mostly use pearl cotton thread, the colors in my lap throw seemed to call for flatter, more muted colors that I found in Danish Flower threads. I now order them on line through Nordic Needle. I have also purchased a few hand dyed pearl cotton threads at quilt shows and have even used Sashisko quilting thread, as it is coarse and decorative. It can also be purchased on line. I haven't tried silk or metallic threads, but the possibilities are endless! I've been wondering at the name "penny rug" and can't wait to hear the history, thanks. Is it an east coast thing? Love the bunny, by the way. Is that available in a kit? So glad you've posted! I apologize for my late response but things have been so busy here! The Penny Rug history is coming! I promise. I don't have the bunny in kit form yet, but will keep it in mind if it is something you are interested in! We will be working on more patterns and kits over the winter when Hannah has more time to give me! She is my designer and while I come up with the patterns, she makes them legible to the rest of the world.